I discovered that Diana Wynne Jones had died through Neil Gaiman's Twitter feed. All credit to Mr Gaiman, who was a close friend of hers, for letting people know that she'd gone, but it seemed inadequate. Why hadn't I heard the news on the radio? The Ten O'Clock News? Why wasn't the internet crawling with obituaries? It seems horribly disproportionate that someone whose work enriched my childhood to such an extent, and whose books continued to bring a little bit of magic and wonder into my life right up until today, who has had such a huge influence on the way I write and the things I write about, could pass away with so little fanfare. I've been reading Diana Wynne Jones' intricately-plotted fantasies since I was about seven or eight. The Ogre Downstairs, her third novel, was the first of her books that I read. It's a clever, darkly comic tale about a dysfunctional step-family and an almost vindictively bewitched chemistry set, but it's more than that. It's also the story of how all the characters come to understand each other a little better in the chaos, and learn to look beyond themselves and see things from others' points of view. And this is a theme that you'll see a lot in Diana Wynne Jones' work: people muddling through as best they can, trying to make sense of the anarchically entangled mysteries around them, and terribly mismatched individuals finding a little scrap of common ground. I honestly can't think of another children's author who creates such beautifully-drawn, three-dimensional, likeable characters. Her knack of making you like people who are really terribly flawed, showing you that there is a little part of them that's ultimately well-meaning, is second-to-none. So many children's authors resort to black-and-white portraits of good-or-bad. Diana Wynne Jones' magical worlds and bizarre people are never so simple. They're complex, ambiguous and real, as are their relationships. She excels in creating characters with an awkward, unconventional, irresistible charm. 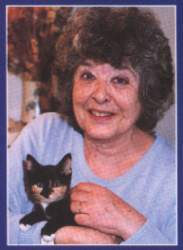 I'm so very sad to hear that Diana Wynne Jones has gone. I owe her a lot. Without Diana Wynne Jones I'd probably never have written some of my very earliest longer fiction, handwritten in notebooks in green biro in my early teens. More importantly, without Diana Wynne Jones I'd never have spent that summer's afternoon aged 11 lying in the garden reading the eerily beautiful, confusing, haunting Fire & Hemlock, a book which had such a profound effect on me that I dreamt about it for months afterwards and still read at least every couple of years. I'd never have read Howl's Moving Castle, which provided me with several hours of perfect, much-needed fairy-tale escapism at a point in my teens at which I was at my lowest ebb. And I'd never have discovered Chrestomanci, my first literary crush, when I was eight. So, thanks Diana Wynne Jones. You'll be terribly missed. I´m sorry! I cried myself all puffy when Astrid Lindgren died and she was really old. I´m intrigued, though. I´ve never read anything by her as many of her books haven´t been translated to Swedish. I´m sure I would have come across them otherwise, during my childhood. I´ll look into it now!